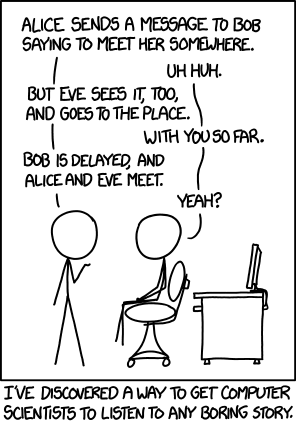 Who are Alice and Bob? Simply: Who are Alice and Bob, and why are they mentioned in every Bitcoin-related article I read about that talks about Bitcoin transactions? What is the history or mystery of these two? Fictional characters. Cryptography (and other) books use names like that often. Alice and Bob are placeholder characters corresponding to the letters of the alphabet. They are used especially in computer science to describe use-cases or scenarios. The scheme is used because it's more convenient to say "Alice sends money to Bob" than to say "Party A sends money to Party B". As each name has a different initial, diagrams can fall back to single letter labeling. How do buy and sell orders work? Mining operations: what's allowed and what's not? How do Bitcoin transactions work, and what does one need in order to send or receive one? Is there a correct way to refer to “orphan” blocks? What is the difference between a miner and a full node? Does bitcoin deflate or does it appreciate? Why isn't bitcoin itself its own ledger?